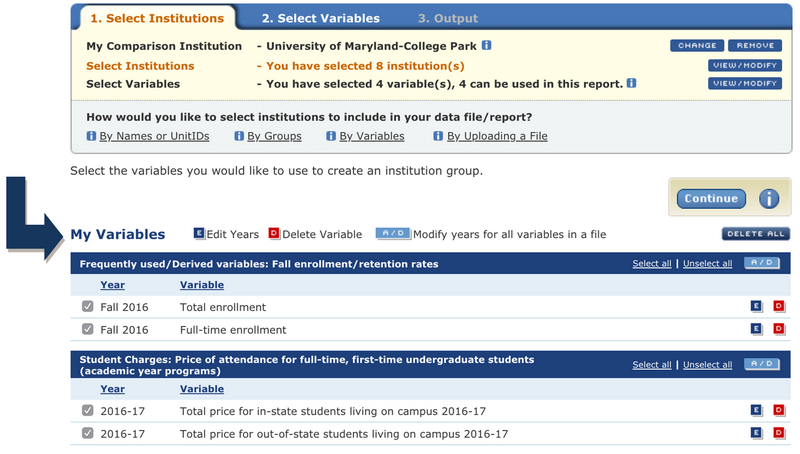 This data tool allows you to generate a report containing summary statistics for a group of institutions for one or more IPEDS variables of the choice. Next, select the IPEDS variables to include in the report. Click on the icon to expand a section of the tree and the icon to collapse it and select the variable by clicking in the box in front of the variable. If variables have already been selected or uploaded for a previous task during the current Use the Data session, the existing My Variables list will be displayed. This includes any derived variables you may have created. If variables have not yet been selected or uploaded from a previous session, refer to the Shortcuts section on how to Create, Save, or Upload Variables for detailed instructions on the options for selecting variables. You may select up to 50 variables to include in this report. Choose from the existing variables in the My Variables list, or select a new variable for this report. Any new variables that are selected for this report will be added to the My Variables list, as shown below. A count will appear at the top of the screen. When finished, click Continue. You may return to the My Variables list and select an alternate variable for the report at any time by clicking on the button in the status bar at the top of the screen. Remember that you may click on Save Session at any time to save the information from the current Data Center session. The final step is to customize the report settings using the formatting choices under Statistics Table Options on the Output screen. 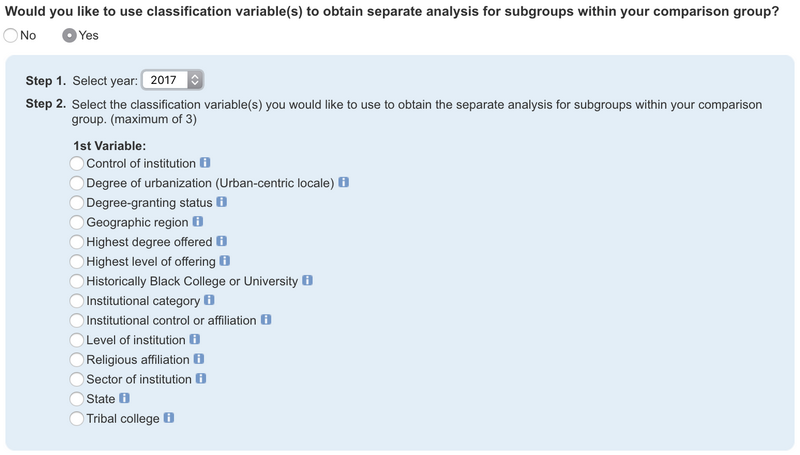 Click on the corresponding option button to indicate whether or not to use classification variables in the report; such as, institutional sector, geographic region, degree of urbanization, and so on to obtain separate analysis for subgroups within the Comparison Group. For example, you may subdivide the results by geographic region to compare the mean total price of attendance for out-of-state students at institutions in the Southwest with institutions in other regions of the United States. If the Yes option button has been selected, a drop down menu will appear. 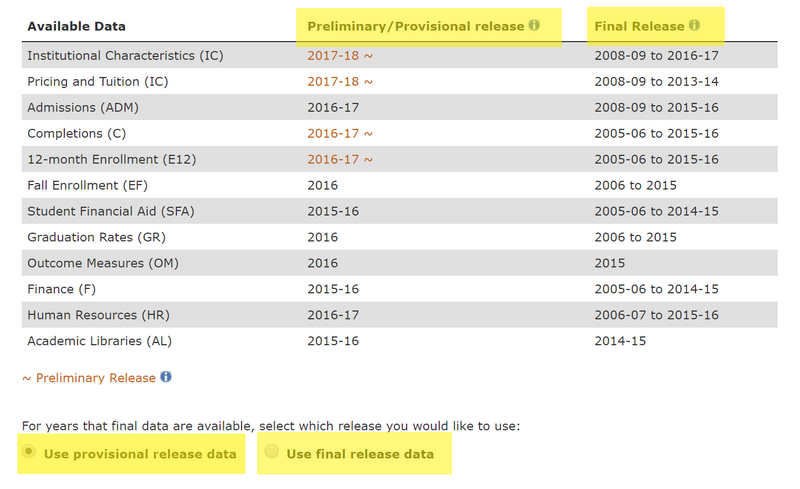 Using the drop down menu, select the IPEDS survey year from which to choose the classification variables, as shown below. Available variables depend on the year selected. Changing the year will clear all chosen classification variables. In addition, when the Yes option button is selected, N Obs is added to the list of statistics available. Like Mean, it is automatically included in all reports and cannot be deselected. While N represents the number of institutions from the Comparison Group that submitted data for the selected variables, N Obs represents the number of institutions from each subgroup expected to submit data for that variable (whether or not they actually did). Next, choose the statistics to include in the report. Click on the corresponding checkboxes to select any or all of the following. Note that Mean is automatically included in all reports and cannot be deselected. To specify a unique title for the report, enter it in the Statistics Table Title field, as shown below. This is not a required field. You may skip this item, or simply leave it blank, to continue generating the report using the default title “Statistics Report”. Select which report items to include and change the name, as needed. Once you are satisfied with the formatting choices, click Submit to generate the Statistics Report. Click on the Modify Options link at any time to return to the Statistics Table Options screen and modify the report settings. To print a copy of the report, click on the Print Report link. Click on the Download link at any time to download a zip folder containing the formatted statistics table. You may view a graph of the report results at any time by clicking on the Show Graph link, as shown below. This option allows you to generate a graph of the group mean of some or all of the variables in the report. If you have selected to use classification variables, you will not see this option. If a Comparison Institution is selected, the Comparison Value for each variable will be displayed alongside the group mean, as shown below. The options under Graph are similar to the options available for View on Screen .